Note: The article on this page is taken from Sustainability Report 2018. （1）Develop technologies for products and services and promote their greater use to contribute to the development of an ICT. （2）Contribute to enhancing the safety of infrastructure through more efficient inspections for the deterioration and malfunctioning of buildings and structures. In modern society, the risks that can threaten people's lives have diversified. Newly arising issues, such as Internet crime, spread along with the rapid advancement of the information society, careless digital data management, and the deterioration of infrastructure are some of these risks. The Fujifilm Group continues to develop and disseminate new technologies that address such ever-changing social risks to minimize their possible damage. In concrete, we are contributing to building a safe and secure society by offering secure means of digital data storage over a long period of time in this big data era, improving information security, and helping to maintain the infrastructure. Started providing a new Infrastructure Photo Analysis Cloud Service, Hibimikke (Crack Finder, April 2018). Development of technology for the recognition of unique objects, Yoctrace, which contributes to security reinforcement and counterfeit prevention. Launched a camera monitor system (CMS) chart set FC-UNR46SET, in March 2018, which complies with the United Nation regulations for a CMS for a vehicle (UN-R46(*)) to be used in the analysis and verification process of vehicle CMSs. This contributes to safety improvement during driving. * UN-R46 Uniform provisions concerning the approval of devices for indirect vision and of motor vehicles with regard to the installation of these devices: Regulations concerning an agreement on indirect vision systems in cars. The Ministry of Land, Infrastructure, Transport and Tourism enforced the revised regulations in June 2016, to permit replacement of rearview mirrors on vehicles equipped with a CMS. This enabled the production of a completely mirrorless car. Vehicles in Japan can now be equipped with CMSs as defined in UN-R46, in place of conventional rearview mirrors. Promote long-term data storage in a safe and reasonable manner by pursuing higher data storage density on magnetic tapes in the world. Further utilization of the technology for the recognition of unique objects, Yoctrace, into security services and quality safety management. Fujifilm received the Prime Minister's Awards under the 7th Monodzukuri Nippon Grand Award (Product & Technology Development category) in recognition as the “large-capacity data tape with outstanding performance in total user costs, an achievement bolstering the era of big data and IoT.” Our magnetic tape was the world's first products adopting magnetic Barium Ferrite (BaFe) particles in 2011, making a technological breakthrough with regards to the capacity limitation of magnetic tapes, which was an imminent issue at that time. 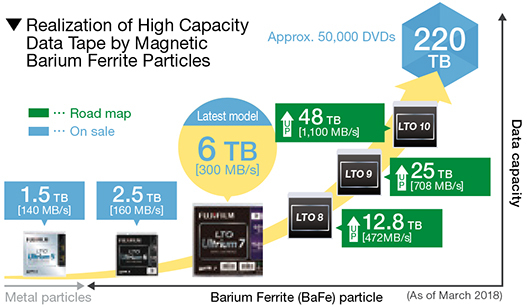 Since the market introduction of our BaFe-based magnetic tape, which significantly enhanced data storage density, the development of data storage systems that utilize our tape has accelerated. The award presented us this time was due to high appraisal of our precise response to the social need of storing big data, which is increasingly used in society, safely and over a long period of time at a reasonable cost, through our large-capacity magnetic tape that contributes to an overall cost reduction for data storage. It was also in recognition of our leading-edge technology that provided a chance of further capacity enhancement of magnetic tapes for the future. We will continue to contribute to the safe and long-term storage of important data through further improvement of storage capacities. Take photographs of the concrete surfaces of bridges, piers, and tunnel for inspection. Upload the photographs to a server, and the service automatically detects highly precise images of cracks larger than 0.1 mm wide (shown as red lines). The service then automatically creates CAD data of images and crack detection results. Fujifilm has started offering a new Infrastructure Photo Analysis Cloud Service, Hibimikke (Crack Finder), which utilizes the high precision imaging technology we cultivated through our medical diagnostic imaging systems. Many major infrastructures in Japan, such as bridges and tunnels, were built during the high-growth period of the Japanese economy and are now experiencing signs of deterioration. Both national and local governments require regular inspections as well as tightening the details of such inspections. However, conventional inspection methods are highly manual, and are therefore time consuming, and securing inspection experts is a growing issue. Such methods include close visual inspections for cracks and other signs of deterioration by inspection experts who possess advanced techniques and knowhow, making records of such deterioration signs by photographs and illustrations, and converting the photographs and illustrations into digital data to create the relevant reports. Hibimikke is a cloud service that can automatically photomontage multiple photographs uploaded to a server and detect cracks using image analysis based on Artificial Intelligence (AI). Further, it creates a comprehensive dataset concerning the detected cracks. Our service supports human inspection work to halve the conventional working time, while significantly improving working efficiency and inspection precision. Through the Hibimikke service, Fujifilm is contributing to safe and efficient infrastructure maintenance, as well as work style reforms through improved working efficiency. A technology for the recognition of unique objects, Yoctrace, developed by Fuji Xerox, can recognize unique objects by identifying a random pattern on the product surface generated during the manufacturing process. Yoctrace verifies with extreme accuracy by matching a product surface with the registered image that contains the entire random pattern, rather than picking up the similar points of the image and the product surface as in fingerprint matching. For this reason, Yoctrace can also be used to help prevent the counterfeiting of cash vouchers and ID cards, which require high security. The service can also contribute to security reinforcement of cryptocurrency in conjunction with blockchain technology. (*2) From autumn 2018, Shoei Printing Co., Ltd., a printing company dedicated to security media, is planning to start five digital security services, including advanced authenticity assessment and authentication utilizing Fuji Xerox’s technology. Fuji Xerox is considering to apply Yoctrace technology for the recognition of unique objects beyond counterfeit prevention into quality control during manufacturing processes and distribution traceability. *1 Announced in April 2016 by the Organisation for Economic Cooperation and Development (OECD). *2 Blockchain: Distributed database that is used to maintain a continuously growing list of ordered records called blocks.